Timeline for Google Maps has finally landed for iOS. 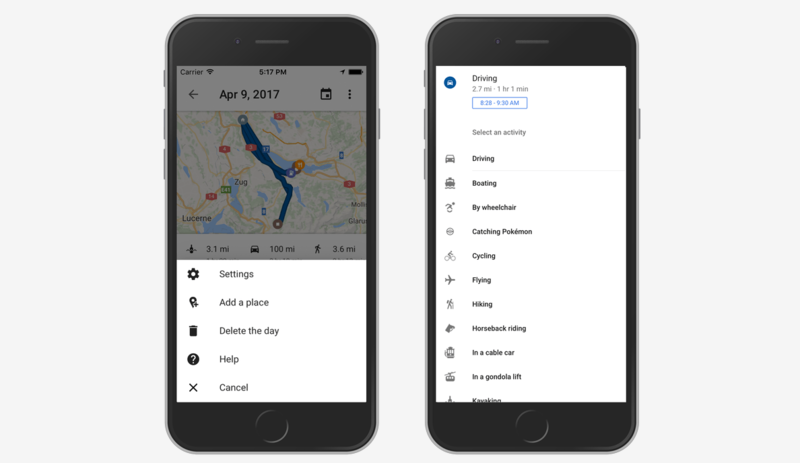 The feature, which launched two years ago for Android users, helps you remember travels and activities around your neighborhood and beyond by tracking your movements everywhere you go. While some might actually find that a little creepy, Google presents Timeline as a fun and potentially useful tool for reminding yourself of past trips, or for eliminating the guesswork when trying to recall a place you visited or a time when you did a particular activity. Aimed at providing “a daily snapshot” of your life, users can edit their Timeline if the recorded information is ever a little off, or even delete a day’s worth of data, a specific date range, or the whole darn lot if you really don’t want to be reminded of a particular day’s shenanigans. It also includes a range of activity and transportation types, allowing you to select from a list to add more detail that could prove useful for later reference. Timeline also offers monthly emails “summarizing the cities, countries, and places you’ve visited.” However, if you’d rather not be reminded that you were just too darn busy to manage anything beyond the daily commute, you can turn them off by hitting the feature’s settings tab and toggling the “Timeline emails” button. The launch of Timeline for the iOS version of Google Maps comes in the same week as the company announced it’s added a brand new exploration element to its other globe-focused tool, Google Earth. You can find out all about it here.